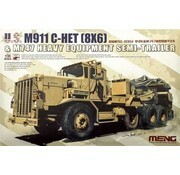 This is a Plastic model kit of the M911 C-Het & M747, a heavy-load truck and Trailer. Plastic model kit of the M911 C-Het & M747, a heavy-load truck produced from the Oshkosh Corporation in the 1970s, used by the US Army. 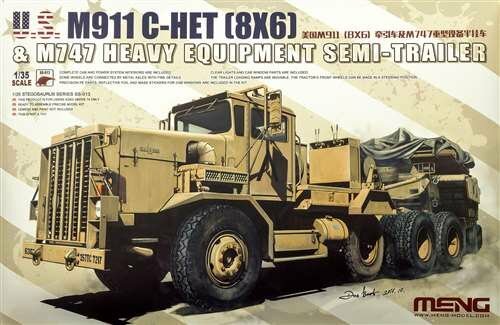 M747 semi-trailer, a 16-wheel vehicle designed for use as a heavy equipment transporter operating on highways and secondary roads. M911 has multi-part frame, full cab (drivers and passenger seat, dash board, steering wheel (movable) and controls), detailed driveline and leaf spring suspension (polycaps, transmission, exhaust, fuel tanks, metal axles, mud flaps), rubber tires plus spare and bracket, fuel tanks, radiator, front grill, air cleaner, rear axle raised/lowered, movable loading ramp, filth-wheel, air spring, shock absorber, heat exchanger, battery box, winch operators station, (2) winch's and metal cable wire, hydraulic oil reservoir, transparent (lights, windshield and windows), reflective foil, die-cut window mask. 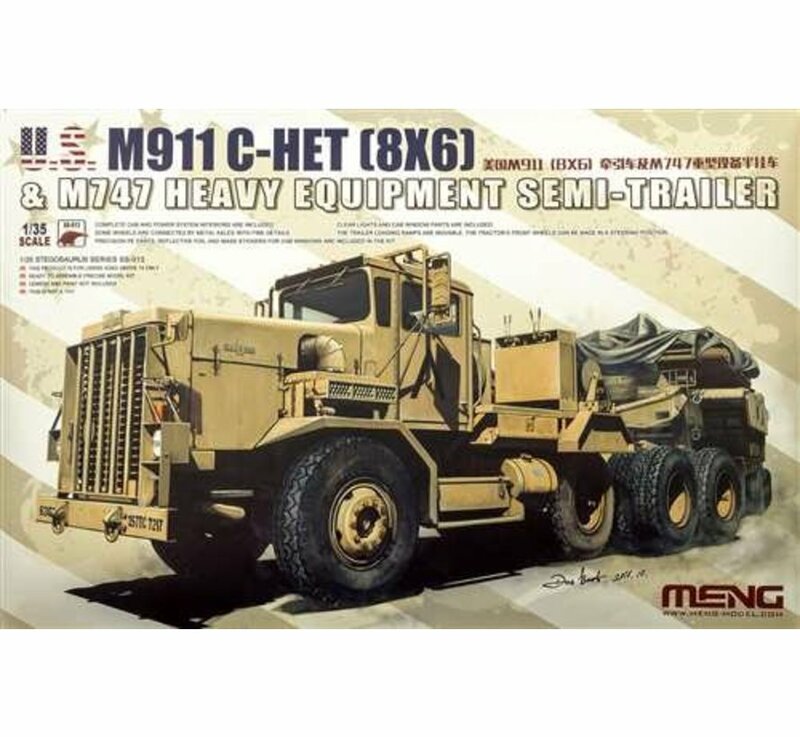 M747 trailer has multi-part frame, suspension, beams, top plate, air tanks, shock absorber, rubber tires w/spare, landing gear, loading ramps, photoetch (exhaust grille, radiator grille, oil reservoir, winch operators station, tire bracket, trailer grille, brackets, latches). Decals and color markings for (2) vehicles: US Operation Desert Storm, Iraq 1991, Sand color and US Tr-color Camouflage - includes vehicle markings, dash panel gauges, door accents and other interior.